"I love that you put about the two Goddesses, there are so many who only believe in taking from one source and one source only, you miss out on so much that way!" It really got me thinking about why we worship the way we do. Yes, we call on the Goddess and God. Usually though, we have our own pantheons that we use. Sean uses Norse gods and goddesses. I usually use Egyptian, but I have no issues including other goddesses and gods as well. In fact, I sincerely believe one of the only reasons we got pregnant was because of Sean's pleading to Freyja. But how many of us get stuck using the same deities over and over because we are comfortable with them? It's wonderful to have a close personal relationship with your gods, but like Little Witch said, you can miss out on so much that way! I'll use our fertility problems as an example. Bes and Isis got me no results at all. For whatever reason, it just wasn't happening. When we calculated back later, about a week after Sean started praying to Freyja was when we got pregnant. 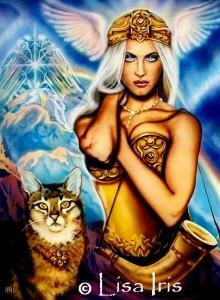 So even though Freyja wasn't a goddess I worked with personally, she obviously worked for us. I have a copy of Pagan Scriptures, written by Charles Baize & Nolan Reichle. They are a beautiful creation story, and I love reading it over and over. If you haven't read it, you should. You can find it at the Green Witch Garden. In it, it tells of the Light as our Goddess and God, and the first children of the light as all the gods and goddesses of different cultures. That struck a real cord with me, because so many traditions state that the pantheon they use is separate. "Isis is Isis, not some crazy offshoot of the Goddess! They're separate!" It seems strange to me to have everything disconnected, when we are essentially a spiritual path that celebrates the connection of all. When we work with our connected goddesses and gods, we can do it in a myriad of different ways. If you call a certain goddess in ritual, use a different goddess' symbol. I'll use love as an example. Say you are doing a spell to draw love to you. So you invoke Venus. On your altar, maybe you would have an eight-pointed star, the symbol of Inanna. Perhaps a white feather, symbolizing Branwen, whose name means white crow. If you don't know which goddesses and gods have similar aspects, it's easy to look up. Thanks to the internet, we don't have to spend all day (or week, or month) cross-referencing this book and that book with this paper. The only thing you need to do is find out which aspects call to you. All are different goddesses, but different aspects of the same Goddess. By only using one, not only do you miss out on the different feelings a certain goddess aspect could bring out in you, but you are diminishing the effect that your rituals can have. No two aspects are exactly alike, and using them together can only play on their strengths.